Cookies don’t come from tubes! As a guy who knows next to nothing about baking, when my friend Brigita offered to write a post about the mysterious world of mixing flour with other ingredients, I said “yes, please”. Brigita is a colleague that always had pastry chef leaning tendencies, so she decided to supplement her corporate life with volunteering at a Brooklyn bakery on nights and weekends. Her official title is Queen of Sales System Administration / Chocolate Chip Cookies. If you have any questions or comments feel free to comment below and /or follow her on twitter @sugarintheraw00 . Enjoy. – Notafoodie! Valentine’s Day can stress people out. This Hallmark holiday yields all kinds of unnecessary psychological damage to people as they prep to unveil and affirm their true feelings to that special person(s). They become so distraught that they may accidentally commit significant crimes against butter, sugar and flour that could have been otherwise avoided. Don’t let bad pastry happen to good people. Once you get a rudimentary understanding of the basics, you can bake almost anything. The fancier stuff can come later, if you are so inclined. Pastry is a bit more disciplined than straight culinary. That part is true, and if you hate to measure and want to interpret at every turn, then there are good bakeries who need and deserve your business. Find those people and be kind and generous to them. They could be a part of celebrations in your life for years and years. My grandfather has been going to Storks Bakery in Whitestone for almost thirty years. He could care less about ever being in a kitchen. He shows up, buys his goodies with hard-earned cash and skips out the door. If you want to make even the most simple of cookies or cakes, you have to be patient. Pastry is rooted in patience. Have I treated my dough with enough respect that it will perform? If I have, I will be rewarded. Sometimes it is all luck or ingredients so good you can’t screw it up. that is true, but as a rule, it is ingredients, technique and patience. 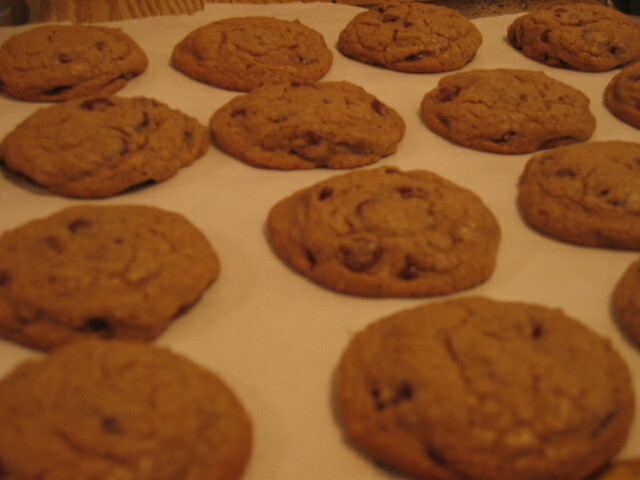 Can't you smell the cookie goodness coming off of the screen? I suggest to all, especially those dealing with a Northeast slush-tastic winter, cookies. I always start with cookies. My rationale: Can be prepared quickly, half of the commitment than a full-on cake, and less messy than cupcakes. The portion size is predetermined. It’s portable, and that’s part of the joy. I can eat this anywhere! Less important, but worth noting, cupcakes always look rather sad once their icing hair-dos are mussed up. Cookies always look chic and have a more complex flavor profile. They also pair well with my best friend, coffee. Always start with cookies. If you like a cookie, there is always a cake or tart version of it. If there isn’t, now you have the incentive to develop an interpretation of it! Get everything prepped before you start! A good mise en place is crucial to cooking of any kind. Turn on the oven 30 to 40 minutes before you plan on baking. In the winter, I make it 45. A proper digital food scale. If you measure ingredients in ounces and pounds, you are winning half the battle of why desserts run amok. There is simply too much of something or not enough of another. Any European-style butter with a higher fat content. I use Plugra or Kerrygold. King Arthur Flour. Not imperative, but does wonders for baking. Let your eggs sit out for 30 minutes before using them. Do not put them near the stove. Always bring your butter to room temperature and never microwave it to speed up the thaw. Good chocolate. Most recipes call for 12 oz of semisweet chips. Interpret that any way you like. Get a few bars of chocolate you like and coarsely chop it up. They can be half milk, half semisweet. It depends on what you like. I prefer 55% cacao and 38% blended together. If you have access to a place that will sell you baking chocolate disks, ask them to weigh out what you need. The best baking chocolates I have encountered are Belcolade and E. Guittard. It is nice to have even-sized chips but chopping them with some precision is fine too. Try to mix in one egg at a time, and do not overmix. The same is true for the dry ingredients. Do not overmix. If you do, your cookies will be flat pancakes. A simple medium-sized whisk to blend all your dry ingredients before you marry them with your butter/sugar/eggs/vanilla mixture. Pockets of baking soda will reflect in the finished product if not properly distributed. Add a bit of cinnamon (up to 1/2 tsp) to the dry ingredients. It gives a nice depth to any chocolate chip cookie, especially if you throw in some walnuts or pecans. A oven thermometer so you know if your oven is really 325, 350 or 375. Mine is always 25 degrees under what the dial says. I ruined some good breads finding this out the hard way. For uniformity, scoop out your dough with a melon baller or any small scoop. Line any cookie sheet with parchment paper if you do not own Silpat sheets . It gives a beautiful, even color to the cookie underbelly. Thanks, Brigita! Now, dear reader, you can save that can of cookie dough for what it is meant for… eating it raw as a late night munchie. Please let Brigita know how your cookie adventures go by commenting below. Holy crap, what are all these specialty items and devices I need? Silpat sheets? Plugra? An oven?! 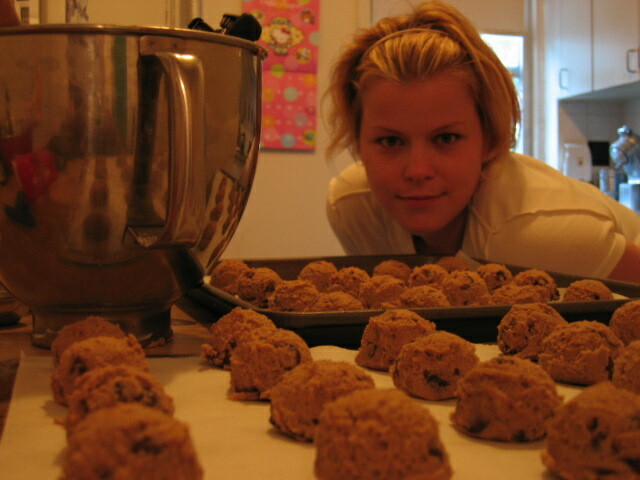 I thought that you were going to agree with Laidlaw that Brigita and I need to collaborate on a bacon cookie. I know why you (Tom) don’t like baking – it violates your cardinal cooking principle of “t’row in a little of this, and t’row in a little of that.” Can’t really do that with, say, baking powder. Laidlaw, I think you’re a bakery guy! 😉 I agree there are costs involved. My oven thermometer cost 7 bucks, and the food scales start at around 20. Silpats are about 20 I find them so useful that I figure I’d rather get the pain up front knowing it will execute good stuff, then buy or make a lot of not so good. The butter I buy in bulk, and all else that I use often (cinnamon, parchment paper) to keep costs reasonable. I am intrigued by the porky collaboration idea. Bacon, maple and nuts go together well. I have never been too impressed with the items I have tried that were bacon pastry. It could be a new challenge to try. I just bought a Silpat from Amazon. I used it last night to make nachos. Just poured some chips on the Silpat, piled some shredded cheese on top, and stuck under the broiler for 5 minutes. I swear, nothing sticks to those things. They are like magic. I foresee a blog post in the future titled “Trying to ruin my Silpat”. I’m taking suggestions on what I should try to cook on it. That’s right, I’m a bakery guy. As a matter of fact- Tom, next time you’re in town- Taste of Denmark. Their pastries are like sugar-coated strippers dancing in your mouth. I’ll drive, you hold the insulin. In the meantime, if you guys somehow manage to have baked bacon goods in your office during the first week of March, I will personally get on a plane and fly there, just to help scientifically evaluate their consumability.